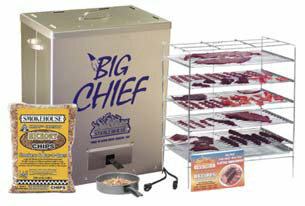 Why choose a Top Load Style over a Front Load Style Big Chief Smoker? The Top Load style is all about efficiency. All 5 cooking grills are held by the smoker rack, and can be removed with one motion. The Top Load Style is great when you are making large batches of the same type of meat, such as smoked salmon or jerky. Electric cord, 5 Easy-Slide Chrome Plated Cooking Grills, Drip Pan, and Flavor Fuel Pan. Use 3-wire plug and cord with a properly installed ground fault interrupter (GFI) circuit. Use the Big Chief only on a concrete or other non-combustible surface, and use it at least two feet from any combustible materials. The Big Chief should only be used outside. 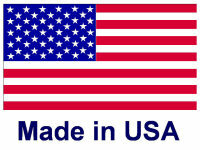 The Big Chief is Guaranteed to be free from manufacturing or component defects for a period of 2 years.